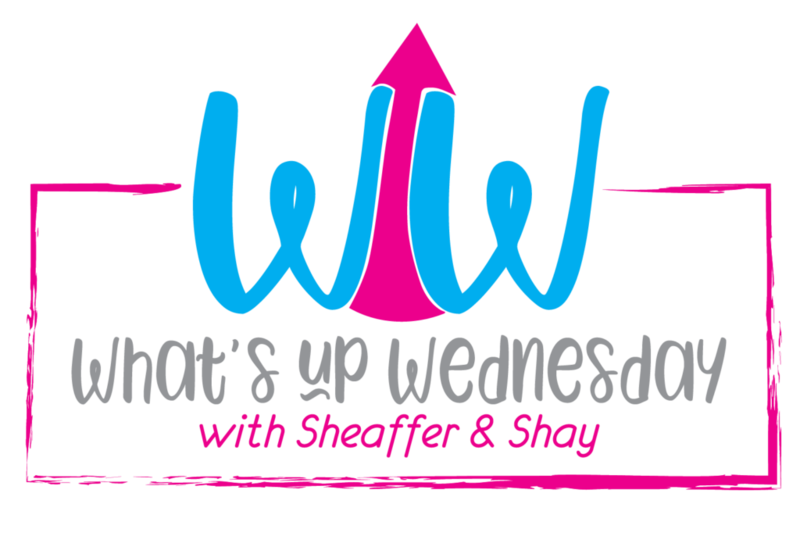 I'm so excited to participate in my very first What's Up Wednesday, hosted by two of my favorite bloggers Shay at Mix & Match Mama and Sheaffer at Sheaffer Told Me To! I have been reading their blogs and this link-up series for a long time and now I get to write my very own post to add-in, woo hoo! This past week we tried two different equally delicious recipes, Mix & Match Mama's Mom's Meatloaf and Enchilada Chili. 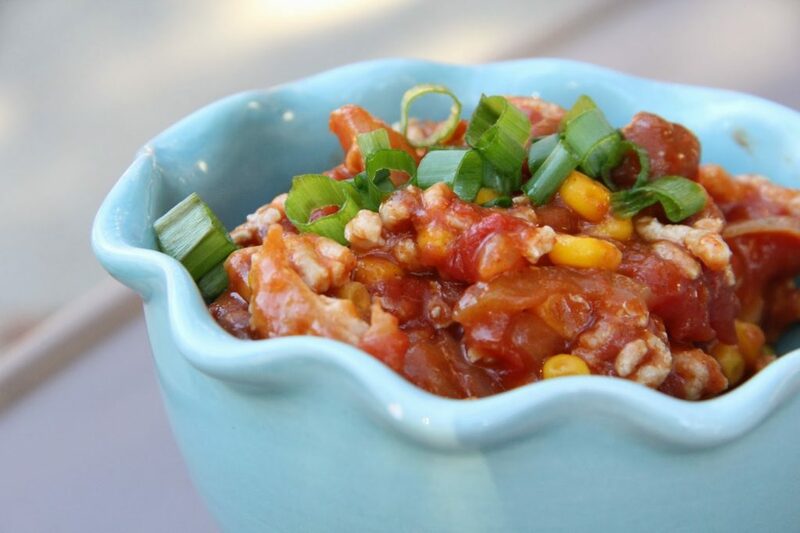 The Enchilada Chili was SO easy to make and makes for the best lunch leftovers, I highly suggest trying that recipe out next week. I also shared my week two meal planning post with printable shopping list, you can read that post here: What's Cookin'- Meal Plan Week 2. I also grabbed some new bars at Trader Joe's for my morning snack, because Mom's like to live that snack life too! I love that you can buy individual bars at Trader Joe's, instead of buying a whole box and deciding you don't like that flavor. This one was my new favorite: ONE Protein bar almond bliss flavor, 20g of protein and 1g of sugar, so good! 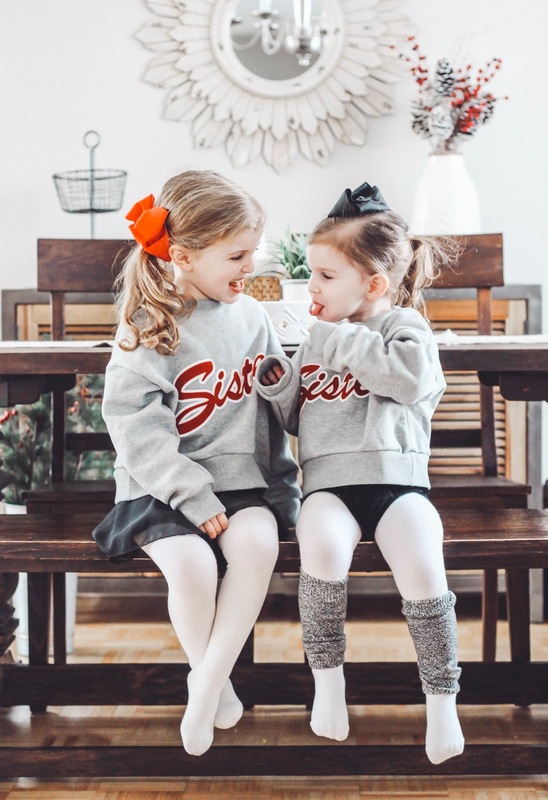 This is an easy one, it's currently -55 with wind chill in Chicago, yes the little ladies and I won't be leaving the house anytime soon! I'm reminiscing about the family vacation we took to Disney World last September! 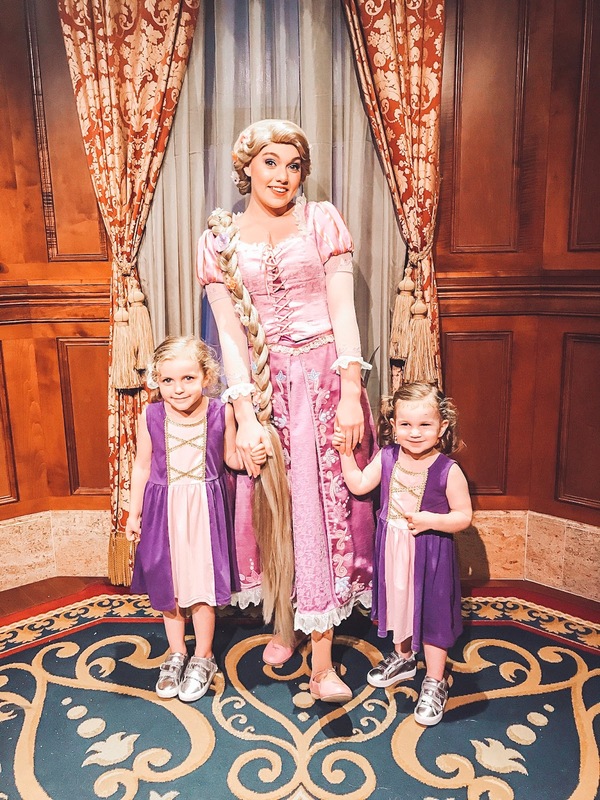 It was the complete opposite weather, extreme HEAT, but we made the best memories and had the most magical time! Here are a few of my favorite snap shots from the trip. 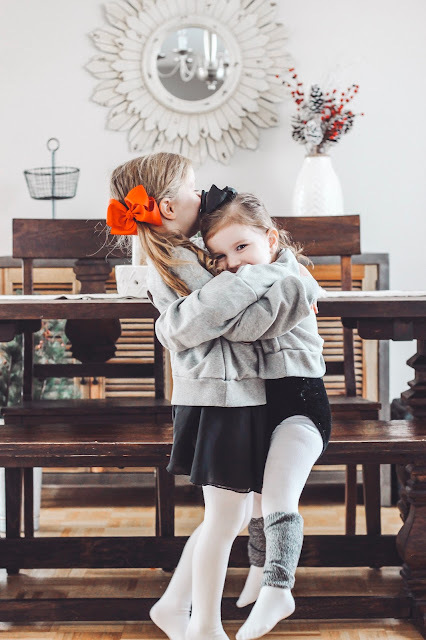 I'm LOVING how well my oldest two daughters have been playing together, they have become the best of friends and I'm so thankful. A whole lot of NOTHING! My little ladies have been taking turns getting sick for the past SIX weeks, it has made for a very, very long January. I am so ready to open up all the windows in this house and air out ALL the germs. I'm dreaming of spring days and playing outside with NO jackets on! The WEATHER! It's hitting record lows here in Chicago this week, today majority of schools and even businesses are closed due to the low temps, we are talking -55 degrees with wind-chill kind of cold! It hasn't been this cold since the winter Avery was born, it makes for a LONG week inside the house when it gets this cold! Finishing Isla's Baby Book! I made really detailed baby books for Avery and Emerson and I'm a little behind when it comes to Isla's, I need to set aside time this weekend to finish up month 10 and 11, not sure how my baby is turning ONE next month! I'll be sharing a blog post on how I make their baby books soon. 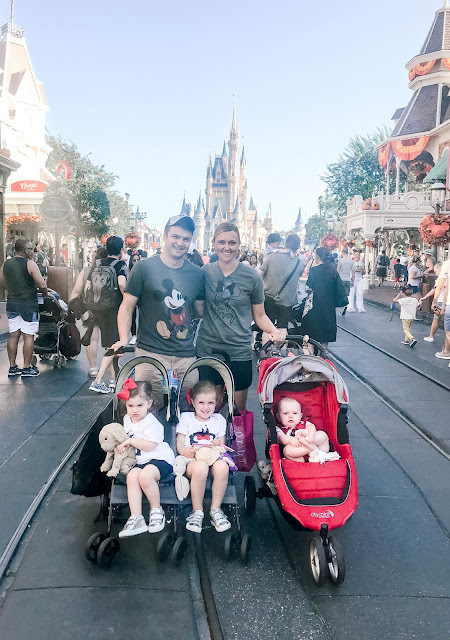 I am SO excited about our next family vacation, we are heading back to DISNEY, but this time my entire family is coming with, which includes my parents and brother, sister in-law and three nephews. We can't wait! I'm already starting to pick out some Disney themed clothing for the little ladies, I can't believe how many stores carry Disney clothes now, here are a few things I have in my cart! 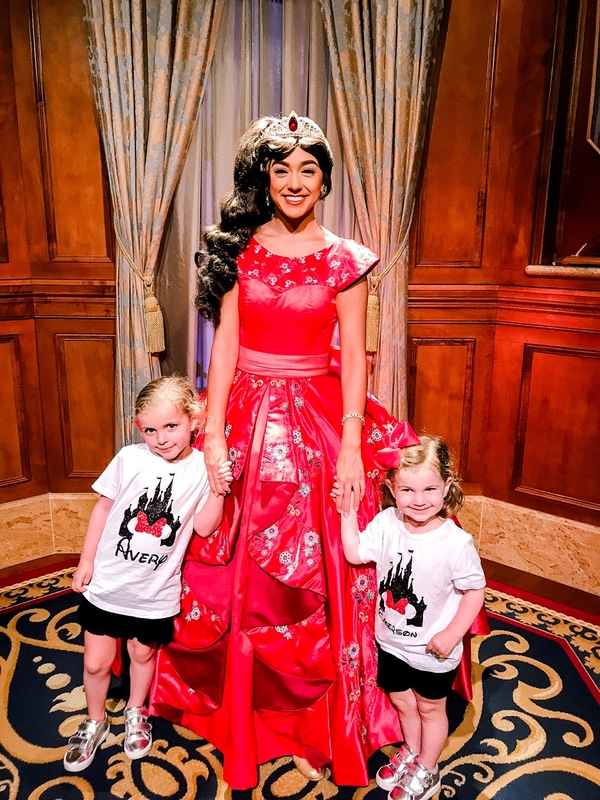 Also, give me ALL your Disney tips, especially when you're at Disney with a party of 12! I am SO far behind on all of my normal favorites, The Bachelor, Housewives, Teen Mom, you know, all the high quality reality TV shows, they are for sure my guilty pleasure! Scott and I have been watching Black Mirror which can be EXTREMELY disturbing, I am usually half watching, while also browsing on my phone, anyone else guilty of that!? I'm also hoping to start the trilogy: P.S. I Still Love You, has anyone else read these? My Mom gave them to me a while ago and I'm ready to start them, there is also a movie on Netflix (I think!?) that goes with them! I love series of three, so I'm excited to start this one! My girls and I love to play music on our Amazon Show, we also have an Amazon Music subscription and our new favorite station is the Motown Classic R &B, think Now and Then soundtrack, so good! 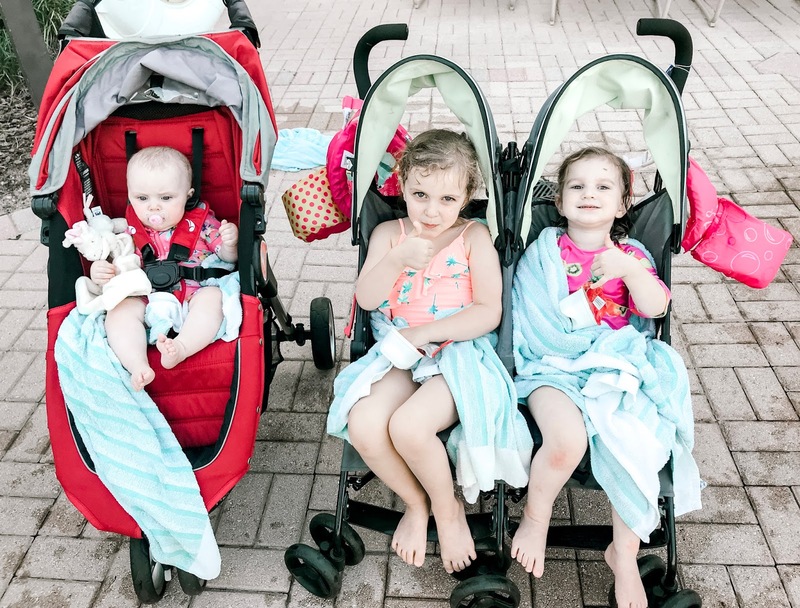 I was able to sneak out of the house last weekend while 2/3 of our little ladies were napping, it felt SO nice to have some alone time! 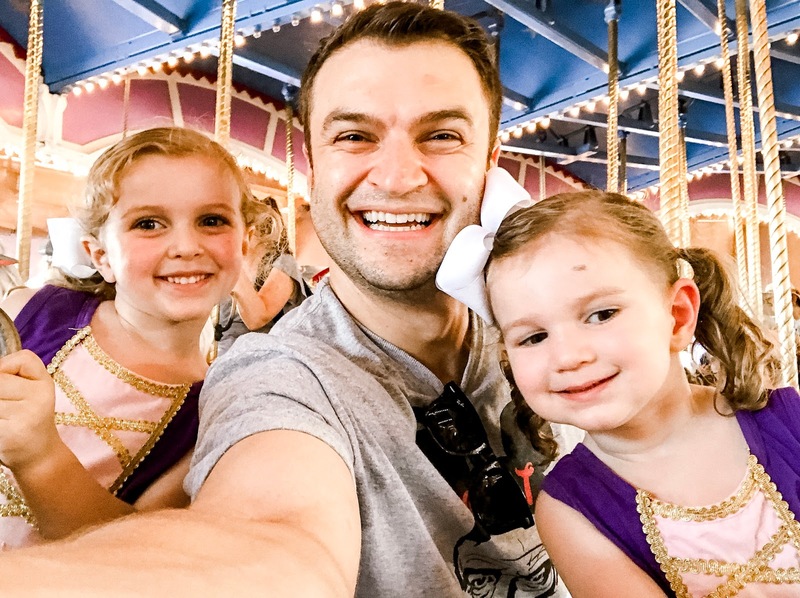 I headed over to Old Navy and JCrew and found some great finds for both the girls and myself. 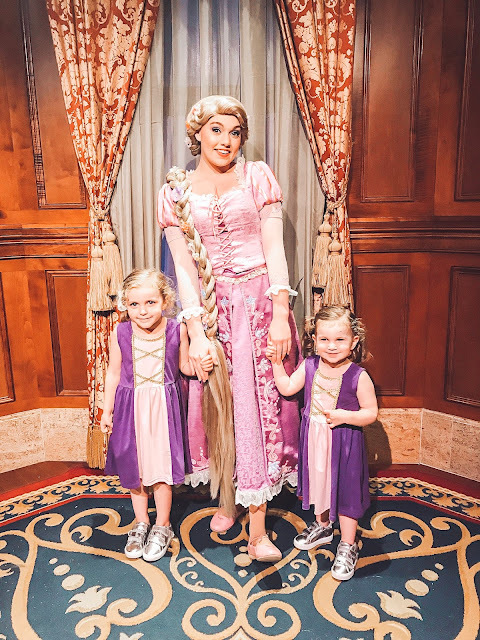 I shared what I found for the girls in my weekend wrap-up post, you can read that here: Weekend Wrap Up- This and That Edition. Here are the few things I got for myself! Do you own a pair of Old Navy's mid-rise or high-rise rockstar jeans? If the answer is no, go treat yourself to a pair! I got mine for $13, they were having an additional percent off for Old Navy/Gap card members and I really should have grabbed another wash too! I also bought the cutest pair of work out leggings and a new work out top, hoping for a little inspiration! Last minute, I decided to walk through J.Crew too and found a great pair of exposed button fly jeans on sale too. I LOVE the Madewell version, but didn't want to spend quite as much, these fit true to size, but are more cropped, so I'll be saving them for Spring! I am SO excited for the weekend, Scott and I are actually going on a DATE night! It has been FAR too long since we had a date and we both can't wait. We are thinking of dinner and a movie, but I'm not confident I can stay awake much past 9:00, ha! I'm also looking forward to Sunday because I love the Super Bowl, probably because appetizers are my favorite! 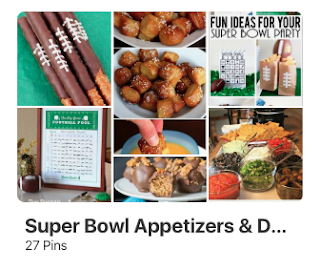 I pinned a ton of recipes on my Pinterest board: Super Bowl appetizers and desserts, stop by and take a look! Follow Me on Pinterest: Snyder Family Co.
12. What I'm looking forward to next month. Our little lady, Isla is turning one! I'm planning the CUTEST Valentine's Day/Donut themed first birthday and it's been so fun to Pin ALL of the ideas on Pinterest. I'm planning on making a Donut Wall, I'll let you know how it turns out. 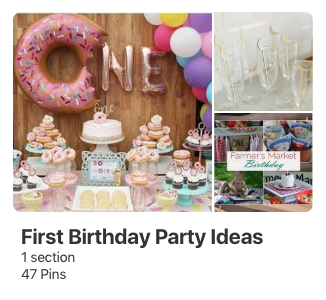 You can see all of my pins, here on my First Birthday Ideas board. Like I mentioned before, we are STILL taking care of sick little ladies, it has been SIX weeks of one of my girls taking turns being sick and this Mama is exhausted! I'm planning on deep cleaning this house today, germs be GONE! Scott and I also just booked a night downtown for a wedding we will be going to next month and we are looking forward to vacationing in our own city, Chicago! Love this one! 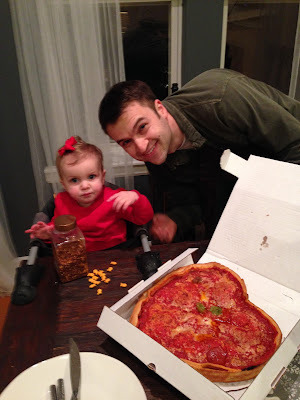 Since the second year Scott and I were dating, we have ordered a heart shaped pizza to celebrate Valentine's Day! 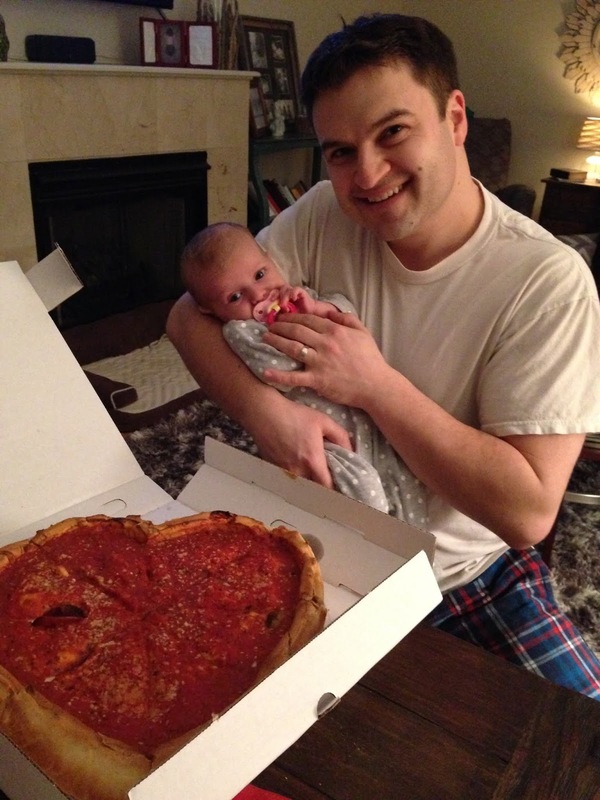 It is now something the little ladies look forward to as well and makes for the perfect cozy night in. We missed our pizza last year because baby Isla had JUST joined the family, so we are looking forward to ordering one this year with all THREE little ladies! 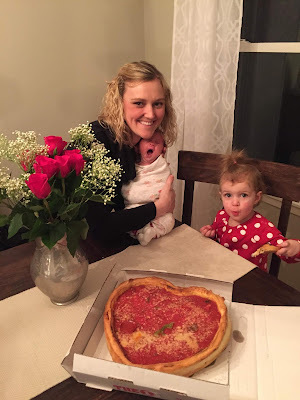 Emerson's First Valentine's Day... Mama looks tired, ha! 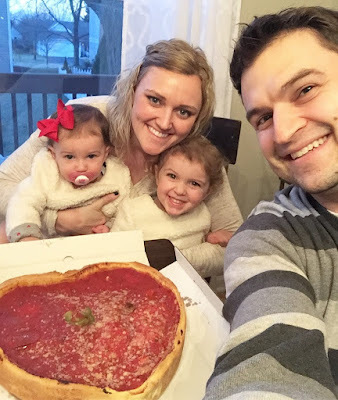 Our last family of FOUR Valentine's Day and anytime you see me with curly hair, it means it was a long week, ha! 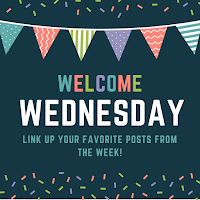 Thanks for stopping by my very first "What's Up Wednesday" post, if you are part of the link-up, make sure you leave me a comment, I would love to come see your post too, happy Wednesday! Hey Sarita! Are you guys all fighting winter germs too!? It's such a bummer, spring where are YOU!? This January has for sure been the longest month of my LIFE! I have tried everything to keep the germs away and they have busted through my essential oils and even LYSOL! I'm ready to open up all my windows and just air this house out, we have to all be healthy soon, right!? 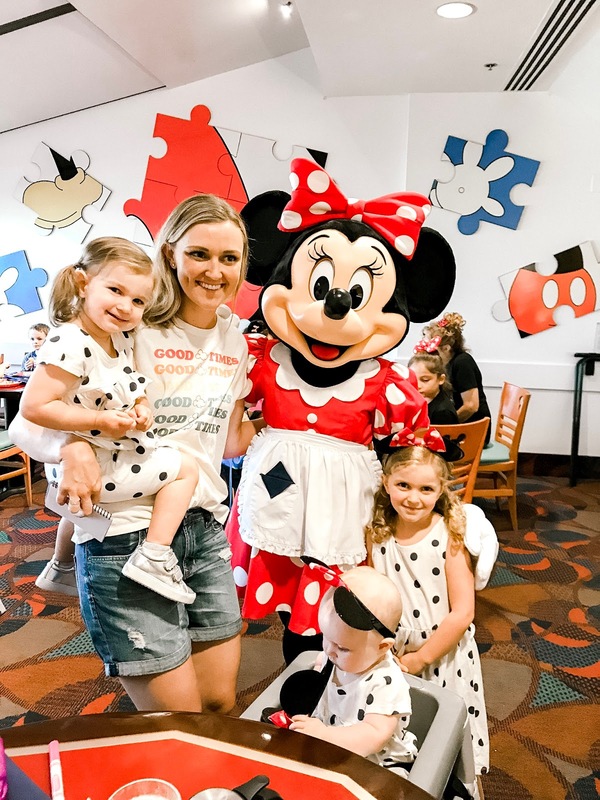 Can't wait to head on over to your blog to see what you have been up to! 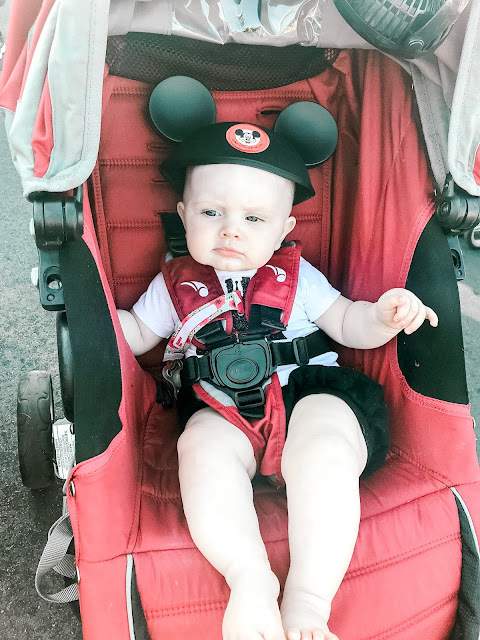 We used to vacation in Disney every other year when our boys were little and we always went mid-way through September or at the beginning of Feb. when the crowds were much smaller. Such a great family vacation destination. I read the PS I love you trilogy and watched the movie they made of the first book on Netflix. It's a cute series.